Cape Town is located in the Western Cape of South Africa and is the second most populated city but is also South Africa’s number one tourist destination. With this is mind we have decided to list the top places to see and go whilst on your holiday to Cape Town as there is so much to do in and around the city itself. Table Mountain is the backdrop to Cape Town and can be seen from most places in the city. This will be on top of most peoples to do list when visiting and it is not hard to understand why. You can either hike or what most people do is get the cable car to the top of the mountain. This is a great way to go up as they cart rotates so you get to have a 360 degree view on the way to the top. Once you arrive at the top of the mountain the views over Cape Town are stunning. You can explore the mountain on the various trails that take you the length of the level plateau from where you will be able to see the beaches of Camps Bay and Clifton and maybe a few Dassie’s which resemble Guinea Pigs who have made the mountain their home. Cape Point is the most South Westerly point of Africa and is not actually the most Southern point which it is regularly thought of. The area of Cape Point has stunning coastal views and some lovely beaches; although at many of the beaches you cannot actually go swimming as the sea is so rough. This does not matter though as the walks through the reserve are amazing and you have a chance to see Baboons, Ostrich and if you are very lucky Zebra. 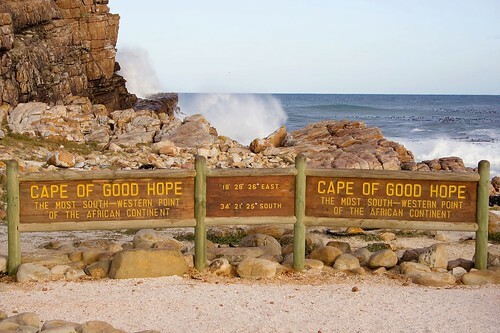 No visit here would be complete with your photo taken at the Cape of Good Hope so do not forget your camera. On the outskirts of Simon’s Town is Boulders Beach, which is a sheltered bay home to a colony of African Penguins. Forming part of the Table Mountain National Park the colony started with just two breeding pairs in 1982 and has now grown to 3,000. To view the penguins up and close it is best to use the wooden boardwalk at Foxy Beach which will take you down to the beach but with a great vantage point so you do not disturb the birds. This island which is 7km off the coast of Cape Town is famous for housing South Africa’s former president Nelson Mandela alongside many other political prisoners. Today the prison is no longer in use and is now a museum where you can join a guided tour of the island and the prison itself. At the beginning section of the tour you will be taken around the island by coach where you will be told the history of the island and of the various buildings that occupy it. The second section of the tour will see you go into prison where you will be guided via an ex-inmate of the island so you can get a first-hand prospective of life in the prison. Although you could argue that there are better things to do on your South Africa holidays, but there is nothing better than joining the locals at sunset in Camps Bay for a light meal and cocktail whilst sun slowly goes down over the picturesque beach. A tip here is to book as it can get very busy and the best tables outside go very quickly and it is just not the same when stuck in the back of a restaurant and looking at the backs of people’s heads. Todays guest post is by Matt Coe. For Holidays to South Africa check out www.wanderforth.com.